License grants you to install the app on your own web server or hosting (PHP / MySQL), - or to use Helpdesk app in the cloud with no additional charge on any pricing plan ($7.99/mo app rental fee will be waived). Establish your own support service! 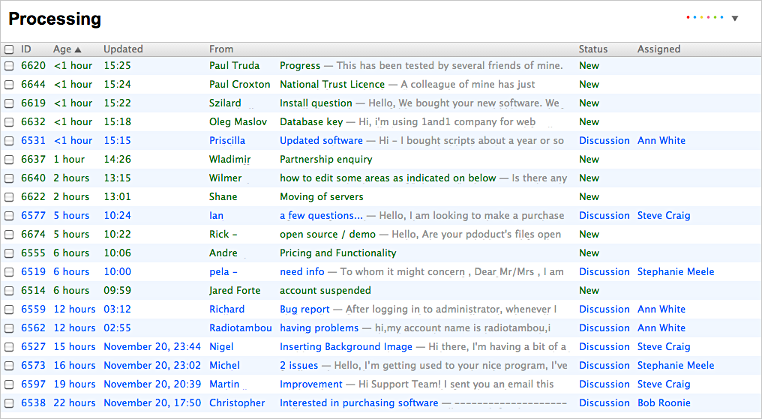 Let everyone in your team process support requests in one convenient place. Helpdesk app is focused on managing customer requests from numerous sources. These sources may include business email addresses or custom forms published anywhere on the web. Advanced routing uses actions to move requests from one state to another while they are being processed. 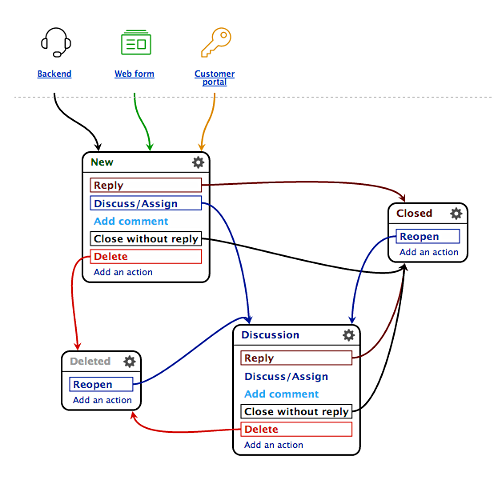 A workflow schematic makes it easy to visually follow the request routing. This innovative workflow technology simplifies complex request processing. Cross-workflow transitions make it possible to scale instantly to any business size. No "per-agent" fees or any other fees make this the best help desk value on the market today. In any actively operating business, clients have comments or queries about all sorts of issues. Customers always want to ask you a question. All you need to do is to create a comfortable environment for them to do so, encouraging your clients to return to you again at least for a little consultation and then often ordering something else! Via a feedback form on your website. A website visitor needs to enter his email address, a query, and a subject, then click on "Submit" to send a request. From a personal online account. This is a special password-protected page on your website for every person who has already sent you at least one support request. Your customers can use their page to create new requests as well as to view your replies to previous requests and execute various actions with them; e.g., cancel a request if a reply is no longer necessary or reopen it if additional information is required. By email. Your company's email addresses at which you are accepting customer feedback can be connected to Helpdesk, and you can process messages sent to those email addresses just as you do with an ordinary email client. There is a very favorable difference: unlike an email client, the Helpdesk app can be accessed and used by more than one member of your support team. By telephone or by any other method. In this case you can simply create a new request on behalf of your customer and process it it exactly as you would have processed a request received from that customer in one of the above ways. What does it mean to process a request? In the simplest case, when you have received a request from a customer, all you need is to send a reply. However, that is not always possible because a request may require attention of a technical specialist or approval from higher management. In large companies, customer requests are often filtered by theme and forwarded to the appropriate departments: technical, legal, accounting, etc. Once assigned to a department, the requests are then forwarded to individual specialists in charge of handling such queries. This complex process can be managed only by using a well-organized request-processing scheme. This is why Helpdesk utilizes the workflow concept as its core. Imagine a river—a flow of customer requests. With Helpdesk's special instruments (actions) any request within this flow can be directed in the desired direction; e.g., replied, forwarded to a specialist (discussed), deleted (i.e., spam), or closed without reply. Execution of any action on a request can move the request to another state or leave its state unchanged, and this depends on the specific action. For example, if you have just received a request, it is new. After you reply to the customer, the request becomes closed. Should the customer decide to ask you something else in relation to a closed request, that request becomes reopen. It becomes closed again after you send an additional reply to the customer. A different example is the "add comment" action, which does not change the state of a request. Suppose that you have received a request and are not ready to provide a detailed reply right away; however, you want to add a note for yourself, i.e., add a comment to the request, which will be useful later when you have enough information to complete a reply. Adding a comment is also an action, but in this case it does not change the request state: if it was new before, it will remain so with a comment added. Arbitrary workflow setup: delete unnecessary actions or states and add your custom ones. Email notifications for different actions (adjustable): to request author, to assigned user, or to the specified email address. Individual access rights setup for execution of different actions by individual users or groups of users. by words and phrases contained in requests, replies, and comments. Request filters: common for everyone and individually adjustable. You can filter requests by states, assignments, sources, and other parameters. Automatically updated list of new requests. Regardless of what app you are working with, an indicator with the number of new requests will appear next to the Helpdesk icon in the main menu, so that your clients will not have to wait long for your response. Try now, it's free to do so!